The skin and subcutaneous tissue are very thin over the anterior and medial tibia, and as a result, a significant number of fractures to the lower leg are open fractures. Even in closed fractures, the thin, soft tissue can become compromised. In contrast, the fibula is well covered by soft tissue over most of its course with the exception of the lateral malleolus. The tibia and fibula articulate at the proximal tibia-fibular syndesmosis. Fractures of the tibia can involve the tibial plateau, tibial tubercle, tibial eminence, proximal tibia, tibial shaft, and tibial plafond. The common peroneal nerve crosses the fibular neck. This nerve is susceptible to injury from a fibular neck fracture, the pressure of a splint, or during surgical repair. This can result in foot drop and sensation abnormalities. Delayed union, nonunion, and arthritis may occur. Among the long bones, the tibia is the most common site of fracture nonunion. Limb loss may occur as a result of severe soft-tissue trauma, neurovascular compromise, popliteal artery injury, compartment syndrome, or infection such as gangrene or osteomyelitis. Popliteal artery injury is a particularly serious injury that threatens the limb and is easily overlooked. When examining a patient for a lower leg fracture, one should first examine the patient for edema, ecchymosis, and point tenderness. Gross deformities should be noted and splinted. Perform radiographs of the knee, tibia/fibula, and ankle as indicated. A careful neurovascular assessment should be performed, and an emergent fracture reduction should be performed if neurovascular deficits are present. A careful examination should be performed for open wounds. Open fractures require antibiotics and an emergent orthopedic consultation. See the fracture image below. 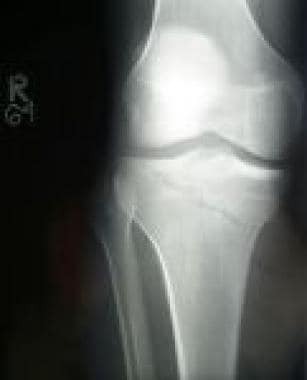 Shown is an intra-articular fracture of the medial condyle of the tibial plateau. For more information, see Medscape's Trauma Resource Center. For excellent patient education resources, visit eMedicineHealth's First Aid and Injuries Center. Also, see eMedicineHealth's patient education article Broken Leg. Fractures of the tibia are the most common long bone fractures. The annual incidence of open fractures of long bones is estimated to be 11.5 per 100,000 persons, with 40% occurring in the lower limb. The most common fracture of the lower limb occurs at the tibial diaphysis. Isolated midshaft or proximal fibula fractures are uncommon. Louie KW. Management of open fractures of the lower limb. BMJ. 2009 Dec 17. 339:b5092. [Medline]. Krieg JC. Proximal tibial fractures: current treatment, results, and problems. Injury. 2003 Aug. 34 Suppl 1:A2-10. [Medline]. Miller NC, Askew AE. Tibia fractures. An overview of evaluation and treatment. Orthop Nurs. 2007 Jul-Aug. 26(4):216-23; quiz 224-5. [Medline]. Newton EJ, Love J. Emergency department management of selected orthopedic injuries. Emerg Med Clin North Am. 2007 Aug. 25(3):763-93, ix-x. [Medline]. Allmon C, Greenwell P, Paryavi E, Dubina A, OʼToole RV. Radiographic Predictors of Compartment Syndrome Occurring After Tibial Fracture. J Orthop Trauma. 2016 Jul. 30 (7):387-91. [Medline]. Beebe MJ, Auston DA, Quade JH, Serrano-Riera R, Shah AR, Watson DT, et al. OTA/AO Classification Is Highly Predictive of Acute Compartment Syndrome After Tibia Fracture: A Cohort of 2885 Fractures. J Orthop Trauma. 2017 Nov. 31 (11):600-605. [Medline]. Busel GA, Watson JT, Israel H. Evaluation of Fibular Fracture Type vs Location of Tibial Fixation of Pilon Fractures. Foot Ankle Int. 2017 Jun. 38 (6):650-655. [Medline]. AO/OTA Fracture and Dislocation Classification. AO Foundation. Available at https://www.aofoundation.org/Structure/resource/AO-OTA-Fracture-Dislocation-Classification/Pages/AO-OTA-Fracture-Dislocation-Classification-Long-Bones.aspx. 2014; Accessed: November 30, 2017. Court-Brown CM, Rimmer S, Prakash U, McQueen MM. The epidemiology of open long bone fractures. Injury. 1998 Sep. 29(7):529-34. [Medline]. Howard M, Court-Brown CM. Epidemiology and management of open fractures of the lower limb. Br J Hosp Med. 1997 Jun 4-17. 57(11):582-7. [Medline]. Grottkau BE, Epps HR, Di Scala C. Compartment syndrome in children and adolescents. J Pediatr Surg. 2005 Apr. 40(4):678-82. [Medline]. Yang JP, Letts RM. Isolated fractures of the tibia with intact fibula in children: a review of 95 patients. J Pediatr Orthop. 1997 May-Jun. 17(3):347-51. [Medline]. Adamich JS, Camp MW. Do toddler's fractures of the tibia require evaluation and management by an orthopaedic surgeon routinely?. Eur J Emerg Med. 2017 Jun 16. [Medline]. Rozell JC, Vemulapalli KC, Gary JL, Donegan DJ. Tibial Plateau Fractures in Elderly Patients. Geriatr Orthop Surg Rehabil. 2016 Sep. 7 (3):126-34. [Medline]. Horwitz DS, Kubiak EN. Surgical treatment of osteoporotic fractures about the knee. Instr Course Lect. 2010. 59:511-23. [Medline]. Hannon M, Hadjizacharia P, Chan L, Plurad D, Demetriades D. Prognostic significance of lower extremity long bone fractures after automobile versus pedestrian injuries. J Trauma. 2009 Dec. 67(6):1384-8. [Medline]. Mustonen AO, Koskinen SK, Kiuru MJ. Acute knee trauma: analysis of multidetector computed tomography findings and comparison with conventional radiography. Acta Radiol. 2005 Dec. 46(8):866-74. [Medline]. Dodd A, Oddone Paolucci E, Korley R. The effect of three-dimensional computed tomography reconstructions on preoperative planning of tibial plateau fractures: a case-control series. BMC Musculoskelet Disord. 2015 Jun 13. 16:144. [Medline]. Mellema JJ, Doornberg JN, Molenaars RJ, Ring D, Kloen P, Traumaplatform Study Collaborative & Science of Variation Group. Tibial Plateau Fracture Characteristics: Reliability and Diagnostic Accuracy. J Orthop Trauma. 2016 May. 30 (5):e144-51. [Medline]. Accousti WK, Willis RB. Tibial eminence fractures. Orthop Clin North Am. 2003 Jul. 34(3):365-75. [Medline]. Sears ED, Davis MM, Chung KC. Relationship between timing of emergency procedures and limb amputation in patients with open tibia fracture in the United States, 2003 to 2009. Plast Reconstr Surg. 2012 Aug. 130(2):369-78. [Medline]. [Full Text]. Konstantakos EK, Dalstrom DJ, Nelles ME, Laughlin RT, Prayson MJ. Diagnosis and management of extremity compartment syndromes: an orthopaedic perspective. Am Surg. 2007 Dec. 73(12):1199-209. [Medline]. Taylor RM, Sullivan MP, Mehta S. Acute compartment syndrome: obtaining diagnosis, providing treatment, and minimizing medicolegal risk. Curr Rev Musculoskelet Med. 2012 Sep. 5 (3):206-13. [Medline]. Ziran BH, Becher SJ. Radiographic predictors of compartment syndrome in tibial plateau fractures. J Orthop Trauma. 2013 Nov. 27 (11):612-5. [Medline]. Schmidt AH. Acute compartment syndrome. Injury. 2017 Jun. 48 Suppl 1:S22-S25. [Medline]. Malhotra K, Pai S, Radcliffe G. Do minimally displaced, closed tibial fractures in children need monitoring for compartment syndrome?. Injury. 2014 Jun 6. [Medline]. Pretell-Mazzini J, Kelly DM, Sawyer JR, Esteban EM, Spence DD, Warner WC Jr, et al. Outcomes and Complications of Tibial Tubercle Fractures in Pediatric Patients: A Systematic Review of the Literature. J Pediatr Orthop. 2015 Apr 10. [Medline]. Casstevens C, Le T, Archdeacon MT, Wyrick JD. Management of extra-articular fractures of the distal tibia: intramedullary nailing versus plate fixation. J Am Acad Orthop Surg. 2012 Nov. 20(11):675-83. [Medline]. Fredericson M, Jennings F, Beaulieu C, Matheson GO. Stress fractures in athletes. Top Magn Reson Imaging. 2006 Oct. 17(5):309-25. [Medline]. Germann CA, Perron AD, Sweeney TW. Orthopedic pitfalls in the ED: tibial plafond fractures. Am J Emerg Med. 2005 May. 23(3):357-62. [Medline]. Haller PR, Harris CR. The tibia and fibula. Emergent Management of Skeletal Injuries. St Louis: Mosby-Year Book; 1995. 499-517. Harris IA, Kadir A, Donald G. Continuous compartment pressure monitoring for tibia fractures: does it influence outcome?. J Trauma. 2006 Jun. 60(6):1330-5; discussion 1335. [Medline]. He B, Wang J. Plate fixation of paediatric fractures of the distal tibia and fibula. Acta Orthop Belg. 2012 Oct. 78(5):660-2. [Medline]. Khalily C, Behnke S, Seligson D. Treatment of closed tibia shaft fractures: a survey from the 1997 Orthopaedic Trauma Association and Osteosynthesis International--Gerhard Kuntscher Kreis meeting. J Orthop Trauma. 2000 Nov. 14(8):577-81. [Medline]. McKoy BE, Stanitski CL. Acute tibial tubercle avulsion fractures. Orthop Clin North Am. 2003 Jul. 34(3):397-403. [Medline]. Ritsema TS, Kelen GD, Pronovost PJ, Pham JC. The national trend in quality of emergency department pain management for long bone fractures. Acad Emerg Med. 2007 Feb. 14(2):163-9. [Medline]. Roberts DM, Stallard TC. Emergency department evaluation and treatment of knee and leg injuries. Emerg Med Clin North Am. 2000 Feb. 18(1):67-84, v-vi. [Medline]. Russell TA. Fractures of the tibia and fibula. Fractures in Adults. 4th ed. Philadelphia, Pa: Lippincott-Raven; 1996. 2127-2201. Sproule JA, Khalid M, O'Sullivan M. Outcome after surgery for Maisonneuve fracture of the fibula. Injury. 2004 Aug. 35(8):791-8. [Medline]. Taketomo CK, Hodding JH, Kraus DM. Naproxen. Pediatric Dosage Handbook. 1999-2000. Vol 6.: 632-633. Standard anteroposterior radiograph of a tibial shaft fracture with intramedullary nail fixation. Note the commonly associated fibular fracture that is also apparent. Radiograph demonstrating a displaced tibial shaft fracture with associated fibula fracture. Type II tibial plateau fracture in a young active adult with good bone stock treated with percutaneous elevation and cannulated cancellous screw fixation without bone grafting. Type III tibial plateau fracture with central depression in an elderly person treated surgically using percutaneous elevation, bone grafting, and cancellous screw fixation. Tibial plateau fractures. Line drawings of Schatzker types I, II, and III tibial plateau fractures. Type I consists of a wedge fracture of the lateral tibial plateau, produced by low-force injuries. Type II combines the wedge fracture of the lateral plateau with depression of the lateral plateau. Type III fractures are classified as those with depression of the lateral plateau but no associated wedge fracture. Tibial plateau fractures. Line drawings of Schatzker types IV, V, and VI tibial plateau fractures. Type IV is similar to type I fracture, except that it involves the medial tibial plateau as opposed to the lateral plateau. Greater force is required to produce this type of injury. Type V fractures are termed bicondylar and demonstrate wedge fractures of both the medial and lateral tibial plateaus. Finally, type VI fractures consist of a type V fracture along with a fracture of the underlying diaphysis and/or metaphysis. Tibial plateau fractures. CT image through the tibial plateau shows a fracture of the posterior aspect of the lateral tibial plateau, which is the source of the lipohemarthrosis. Tibial plateau fractures. Axial CT image through the tibial shows a fracture through the lateral tibial plateau with slight diastasis between the fragments. This is a Schatzker II injury. Tibial plateau fractures. Coronal reformatted CT. This image demonstrates a bicondylar fracture of the tibial plateau along with a fracture of the tibial diaphysis, a Schatzker VI fracture. Note the articular incongruity. Classification of tibial tuberosity fractures.